Accurately communicating payment plans and expected reimbursements allows you to create a more comfortable treatment environment, one where patients can focus on recovery instead of worrying about the cost of their care. 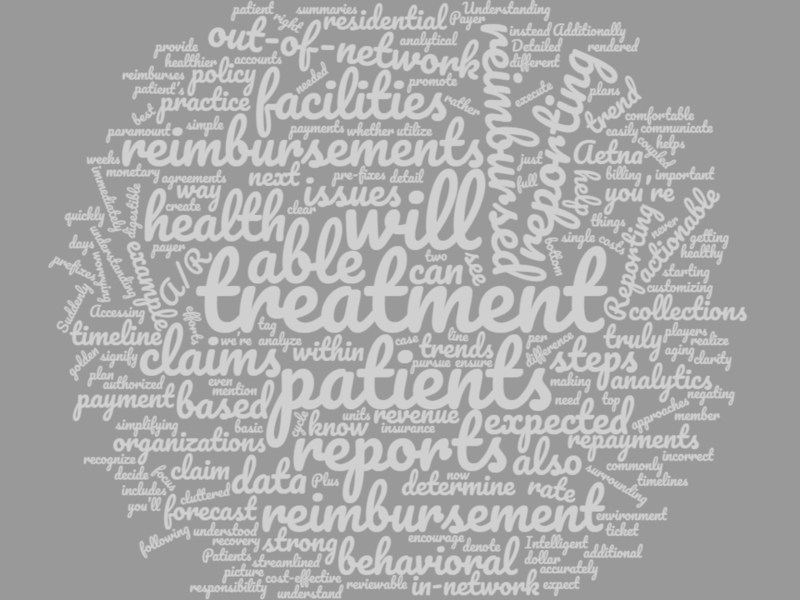 Payer rate trend reports and in-network reimbursement summaries will help with this immediately. Understanding payer rate trends ensures your out-of-network patients are reimbursed to the top dollar, while strong in-network analytics will tag any claims not reimbursed per the patient’s plan. This way, you’re negating any additional, incorrect patient responsibility and saving your patients from future financial headaches. Reporting should also determine how quickly your claims reimburse following treatment. When you’re able to recognize the timeline between rendered treatment and reimbursed claims, you can truly forecast revenue for your practice. For example, if you know Aetna reimburses your residential treatment claims within 10 days of treatment, and you have 5 Aetna patients in residential treatment, you’ll know to expect reimbursements for those patients within 2 weeks of treatment. For out-of-network organizations, this reimbursement timeline data, coupled with reimbursement trend analytics, is a golden ticket to reporting clarity. Suddenly, facilities are getting a full picture of their revenue cycle that includes expected reimbursements and payment timelines. Additionally, reporting based on member policy prefixes helps out-of-network organizations realize data for determining the best way to provide cost-effective treatment to their patients. For example, facilities that can analyze insurance payments based on policy prefixes can ascertain whether they should pursue authorized units or single case agreements based on reimbursement trends. This is when you truly see analytical reporting making a difference on a facility’s bottom line. Strong reports should also detail next steps surrounding repayments and collections efforts. Detailed reporting should be easily digestible, simple to execute, and commonly understood. This is why we’re starting to see more behavioral health players utilizing A/R reports that not only signify aging accounts, but also denote basic claim issues and clearly define the next steps needed for repayments. Intelligent A/R reports are actionable rather than just reviewable reports. Plus, customizing and simplifying actionable issues and steps promotes and encourages streamlined approaches to cluttered claim issues. Successful practices should be scheduling their analytics and reporting on a weekly basis. Doing so encourages a preemptive approach to collections that helps you see claim issues before the payer does, and in turn, saves your facility an additional 30-45 days of delayed reimbursements due to rejections/denials. However, accessing your reporting and understanding your billing data are two entirely different things. In 2019, facilities will need to do both.